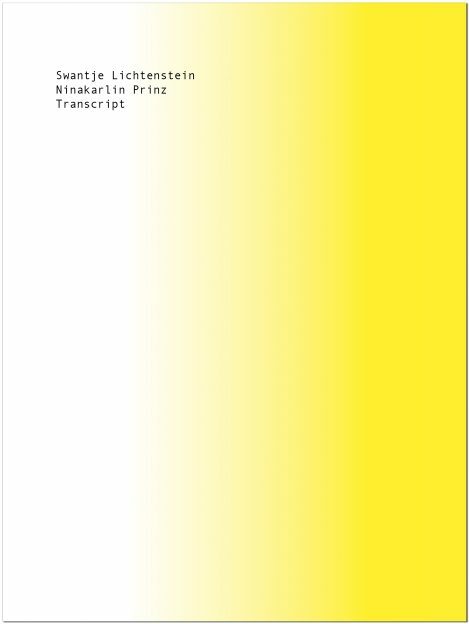 The booklet, coinciding and published as part of an exhibition, features and debates transcription as yet another method of appropriation, illustrated by the two different practices and contributions of the invited artists. Swantje Lichtenstein, who uses collected original voices and quotes from various artists, authors and philosophers as a base material in her performances and soundwriting pieces, retypes the audio samples and finally orders the sentences and fragments alphabetically, repurposing the original sources from an archive into a new text collage. Ninakarlin Prinz, who utilizes found and collected materials in her primarily sculptural arrangements, contributes a silkscreen print of a wooden pattern letratone motive by applying the original foil directly onto the mesh used in the printing process, essentially copying it while also including all the aesthetics and flaws of the silkscreen process.